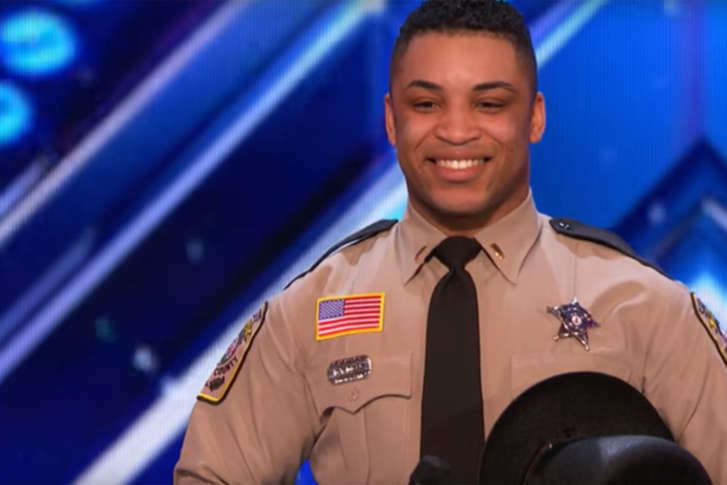 All four judges unanimously rejected Deuntay Diggs, of the Stafford County Sheriff's Office, during his dance audition Tuesday. See video. Simon Cowell, naturally, was the first to buzz, followed by “Scary Spice” Mel B. Heidi Klum and Howie Mandel then joined in, because everyone’s a critic. “What you do for the community is fabulous, and we want to keep you in the community,” Mandel said during the judges’ remarks. As for Cowell, he used his remarks to subtly taunt the Spice Girl. “You were successful without being able to dance,” he told Mel B. In response, she threw a drink at him. The deputy, of course, remained classy throughout and appeared to make an impression with the crowd. “I want people to realize that when they see a cop that we’re human beings, too, and we like to let loose and have fun,” he told the judges before his routine. Diggs enjoyed viral fame last October when he danced with North Stafford High School students during a pep rally. According to NBC Washington, that routine drew the attention of producers for the NBC talent show. He also told viewers that as a performer, he’d like to have the success that he’s enjoyed as a deputy. NBC Washington’s Shomari Stone captured the deputy’s reaction to his turn on stage Tuesday night. “I’m at a loss for words right now,” Diggs said, laughing.